Happy New Year! A little late I know but there has been a lot happening to keep me busy! I had some serious health problems at the end of last year which has taken some time to recover from. One thing I did learn was just how important making jewellery and enamelling is to me. Being able to spend time in my studio creating is wonderful stress relief! Apart from being with my family, it is the very best thing and I feel very privileged to be able to do this full time. I took part in a monthly challenge like this a few years ago and I thought it would be fun to repeat it. My first piece is a Dragonfly Pendant. 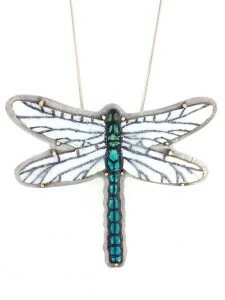 The dragonfly is copper with black under-glaze detail on silver foil and transparent enamels. It is set using 18 ct gold on a textured silver base and hangs from a silver chain. Hope you like it.